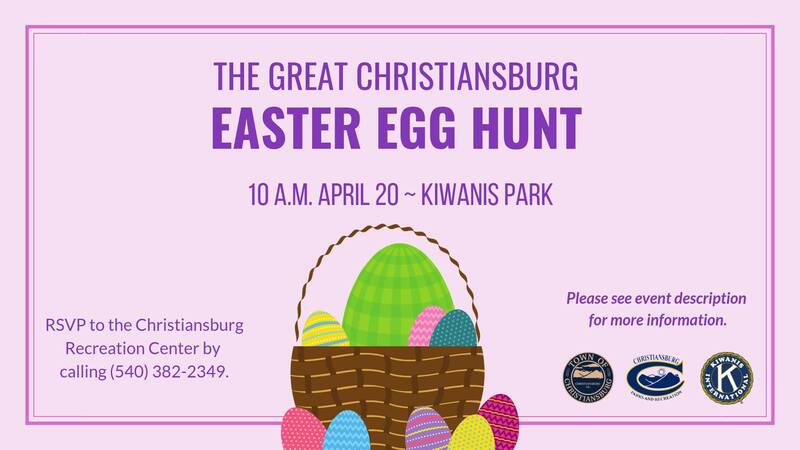 The Christiansburg Department of Parks and Recreation and the Kiwanis Club of Christiansburg present the annual Great Christiansburg Easter Egg Hunt for Ages 0-12 on Saturday, April 20, 2019 at the Christiansburg Rec Center. UPDATE: The location has changed due to the weather. The Egg Hunt will now be at the Rec Center instead of Kiwanis Park. Participants must RSVP for the event by 5:00 pm on April 19th by calling 540-382-2349. Photos with the Easter Bunny will be available for $1.00. Please arrive early to make sure your child is able to get their age-group wristband to secure their spot before the hunt begins. Participants please bring your own basket. Note: Your child must hunt in their age group. In event of inclement weather, the event will be held inside at the Christiansburg Recreation Center. Please call after 8:00 am on Saturday, April 20th, to see if the hunt has been moved. To view the event flyer, visit: https://i.imgur.com/g8aduCI.jpg. For more information, visit: https://www.christiansburg.org/Calendar.aspx?EID=3569 or https://www.facebook.com/events/339666783322760/.